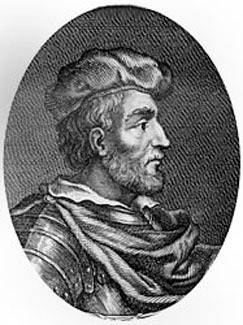 Duncan I, a son of Crinan or Cronan, lay abbot of Dunkeld, and became king of the Scots in succession to his maternal grandfather, Malcolm II, in 1034, having previously as rex Cumbrorum ruled in Strathclyde. His accession was the first example of inheritance of the Scottish throne in the direct line. Duncan is chiefly known through his connection with Macbeth, which has been immortalized by William Shakespeare. The feud between these two princes originated probably in a dispute over the succession to the throne; its details, however, are obscure, and the only fact which can be ascertained with any certainty is that Duncan was slain by Macbeth in 1040. Two of Duncan's sons, Malcolm III Canmore and Donald V Bane, were afterwards kings of the Scots.